Perched high on a cliff, this small oval lake is located in Alberta, Canada in Waterton National Park on the very border with Glacier National Park in Montana. 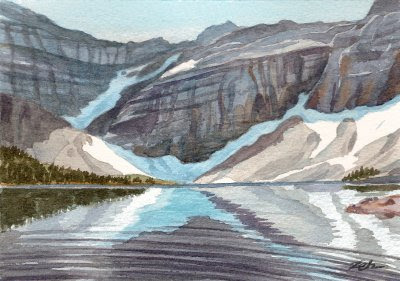 In fact, the cliffs with the glacier shown in this painting are in Montana as they are on the south shore of the lake. When you are standing looking across the lake at the glacier, you are in Canada. The snow is there year round and, believe it or not, people swim in the icy lake during the summer. If you want to see this scene for yourself, put on your hiking shoes and bring plenty of water and a picnic lunch. The approach involves a ferry ride on Watertown Lake to the trail head, then several mountains to climb. When you are through with that, and hopefully haven't met up with a grizzly, you ascend the cliff to the lake along a goat trail and up a ladder to pass through a small tunnel then a short hike to the lake. The scenery is worth it, though, and if you also hike around the lake, you will have hiked in two countries and two national parks in one day!